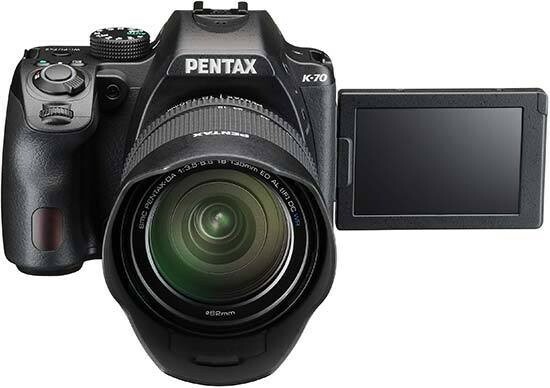 The Pentax K-70 is outwardly a minor refresh of 2013's K-50 DSLR camera, offering a very similar control layout with a better, deeper grip and new thumb-rest. Inside, though, are a lot of improvements inherited from the more expensive K-3 II and flagship K-1 cameras, including the innovative Pixel Shift Resolution technology, an improved anti-shake system, AA-filter-free optical design with anti-aliasing filter simulation function, built-in wi-fi connectivity, and 14-bit RAW files. The K-70 even has a few aces up its proverbial sleeve in the form of the handy vari-angle LCD, wider ISO 100-102,400-equivalent range, a new hybrid AF system which includes on-chip phase-detect autofocus pixels, and full-time autofocus during movie capture, all of which we'd expect to see featured on all future Pentax DSLRs. Although it might look like the 3-year-old K-50 at first glance, there's a lot of new things going on under the hood that make this a compelling mid-range DSLR camera.